It was one of those choices, will I or won’t I? The rain was heavy and not easing, clouds almost touching my ankles and the wind had me bent sideways, do I go on a cruise on Milford Sound? I had already waited a day or two hoping for a change in the weather, but well when in Rome……….so I went! What a morning. I could hardly see a thing. Mitre Peak you say, over 1km high, really? Not this day. But boy did I see waterfalls – everywhere! Throughout the year I believe there are only 4 full time waterfalls in Milford Sound, this day I saw so many more I lost count. Not many photographs to share with you as any time I pointed my camera it got a wash. But oh… to be so close to the full power of water on such a tumultuous day was invigorating. A day to feel it rather than photograph it. I met a retired couple from Australia on the boat, she stood outside on the deck in the rain grinning for most of the trip. “Why are those people inside?” She enquired genuinely. “Why would you come here are want to see it through a window instead of feel it?” She was sincere in her puzzlement. “ I have dreamed of this for years………Wasn’t today just amazing?” She gushed when we were back on dry land. Life is all about how you look at! 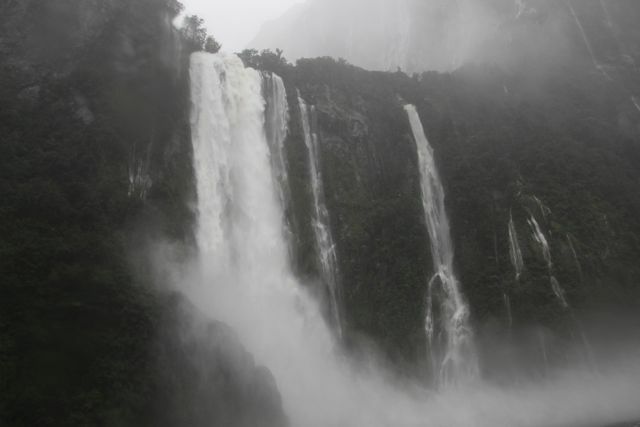 It certainly looked torrential but apparently more rain makes for better waterfalls on the sounds, right?